Office Ian Campbell, pictured at left, was slain by ex-convicts in the 1963 "Onion Field" killing, which left a major mark on the Los Angeles Police Department. On Friday, the intersection of Carlos Avenue and North Gower Street was named for him. Ever since LAPD Officer Ian Campbell was killed in one of the city's most horrific police slayings -- later chronicled in a well-known book and movie, "The Onion Field" -- officers have paid tribute to their fallen colleagues with a musical tradition. Bagpipes play at every funeral of an LAPD officer killed in the line of duty. The custom began with Campbell's funeral. Bagpipes played again Friday when Los Angeles city officials dedicated the corner of Carlos Avenue and North Gower Street in Hollywood to Campbell. Nearly 50 years ago, Campbell and his then-partner Karl Hettinger were abducted by ex-convicts they detained in a traffic stop. The officers were taken to an onion field near Bakersfield. Campbell was fatally shot; Hettinger got away. 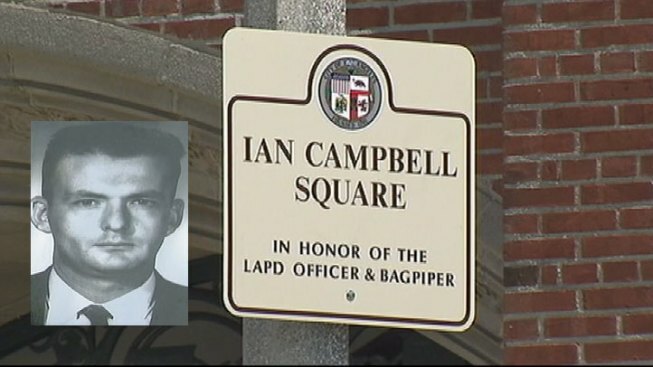 "I'm proud to dedicate this square in Officer Campbell's name so that all who pass here are reminded of his service to and sacrifice for our city," said Los Angeles City Councilman Eric Garcetti after the dedication on Friday. Campbell and Hettinger were on the beat on March 9, 1963, when they stopped ex-convicts Gregory Powell and Jimmy Lee Smith at the Hollywood intersection. After the officers pulled them over, the men produced guns and abducted the officers. Powell shot at Campbell and Hettinger in an isolated onion field near Bakersfield before he and Smith fled. Hettinger, who was not hit, fled to a nearby farmhouse where he got help. Powell and Smith were arrested that year and eventually convicted of the crime. Over the years, Smith was paroled and repeatedly arrested by the LAPD. He died in prison serving time for a parole violation a few years ago. Powell was recently denied compassionate release from prison due to terminal cancer. Ten years after the killing, Joseph Wambaugh, a former LAPD sergeant, wrote the nonfiction account in a book called "The Onion Field," which also became a movie. In an interview on Friday with NBC4, Wambaugh said he hopes the legacy of the book is a reminder to people about the lasting trauma that violence can have on surviving law enforcement partners. "The surviving officer must not be forgotten," Wambaugh said. "I don’t want him to ever be the forgotten man. "He never really escaped the onion field."